The use of prisons has risen dramatically in the last 50 years, with a tripling of incarceration rates in the US and a near doubling in Western Europe, albeit from much lower initial levels. These trends, illustrated in Figure 1, raise important questions about how well ex-convicts reintegrate into society after incarceration, and in particular whether they return to a life of crime. Prison could increase recidivism due to lost human capital, exposure to hardened criminals, or subsequent employment discrimination. Conversely, prison time could deter future offences or have a rehabilitative effect through education and job training programmes. Note: The Western European countries used to construct the population-weighted average include Austria, Belgium, Denmark, Finland, France, Germany, Greece, Iceland, Ireland, Italy, Luxembourg, the Netherlands, Norway, Portugal, Spain, Sweden, Switzerland and the UK. Source: Institute for Criminal Policy Research, World Prison Brief (2016). Understanding the effects of imprisonment has proven challenging for two reasons. The first is data availability, since in many countries the required panel datasets on crime and labour market outcomes either cannot be accessed or linked together. Second, which individuals are sent to prison is not random. While simple correlations reveal that ex-convicts have relatively high rates of criminal activity and weak labour market attachment, this could be driven by their unobserved characteristics as opposed to the experience of being in prison. An emerging literature in the past decade has recognised the limitations of correlational data and uses new approaches and new datasets to sort out causal effects. Our recent work in Norway (Bhuller et al. forthcoming) overcomes the data challenges and non-randomness of incarceration, offering new insights into how imprisonment affects subsequent criminal behaviour. We link several administrative sources to construct a panel dataset containing complete records of the criminal behaviour and labour market outcomes of every Norwegian. We address threats to identification by exploiting the random assignment of criminal cases to Norwegian judges. These judges differ systematically in their stringency, with some sending defendants to prison at a high rate while others are more lenient. Defendants who happen to get a stricter judge face a higher probability of being sent to prison. Since this increased probability is as good as random, the variation in judge stringency can be used to estimate the causal effect of imprisonment. Our study of Norway's criminal justice system yields three key findings. First, imprisonment discourages further criminal behaviour. We find that incarceration lowers the probability an individual will reoffend within five years by 27 percentage points and reduces the corresponding number of criminal charges per individual by ten. These reductions are not simply due to an incapacitation effect, with sizable decreases in reoffending probabilities and cumulative charged crimes even after defendants are released from prison. Our second result is that a misguided correlational analysis would lead to the erroneous conclusion that time spent in prison is criminogenic. If we simply compare criminal defendants sent to prison versus not sent to prison, we find positive associations between incarceration and subsequent crime. This is true even when we control for a rich set of demographics, the type of crime committed, previous criminal history and past employment. Third, the reduction in crime is driven by individuals who were not working prior to incarceration. Among these individuals, imprisonment causes a 34 percentage point increase in participation in job training programs, and within five years, their employment rate increases by 40 percentage points. At the same time, their likelihood of reoffending is cut in half. In contrast, for individuals previously attached to the labour market, there is no significant effect on reoffending and an immediate and lasting 25 percentage point drop in employment. The employment drop is driven almost entirely by defendants losing their job with their pre-prison employer. A handful of papers use similar random judge assignment designs in the US as we do for Norway. These studies find either no effect or the opposite result, namely that incarceration results in higher recidivism and worse labour market outcomes. Mueller-Smith (2015) uses data from Harris County, Texas and finds that incarceration increases both the severity and incidence of recidivism, worsens labour market outcomes, and increases the use of public assistance. Harding et al. (2017) use data from Michigan and find that felony criminals sentenced to prison versus probation have a higher rate of repeat crime three years later, primarily as a result of violations of post-prison parole conditions. Rose and Shem-tov (2018) study felony offenders in North Carolina and find a large incapacitation effect while an individual is in prison, but no significant effect afterwards. Finally, Aizer and Doyle (2015) find that juvenile incarceration results in lower high school completion rates and higher adult incarceration rates. What is Norway doing differently? Given the stark differences in the effects of imprisonment in the US versus Norway, a natural question is whether the US (and other countries) can learn anything from Norway's experience. 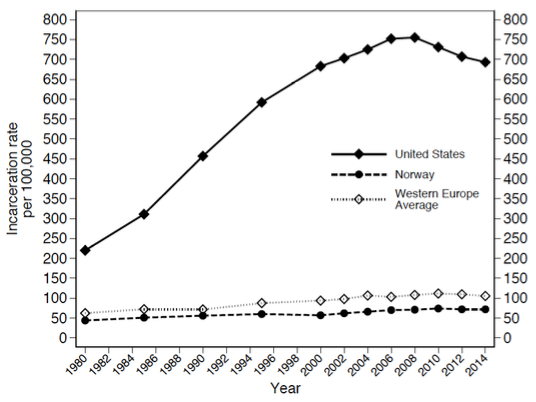 For context, Norway looks fairly similar to other Western European countries and the US in terms of prisoner demographics and the types of crimes committed (with the exceptions that homicides are higher and race plays a large role in the US). The average time spent in prison is six to seven months in Norway and other Western European countries, compared to almost three years for the US. This is the primary reason the US is an outlier in its incarceration rate, a fact which is documented in Figure 2. Note: Sample consists of 160 countries with population greater than 0.5 million and with available data on incarceration and GDP. Incarceration rates and GDP are for the latest available year. 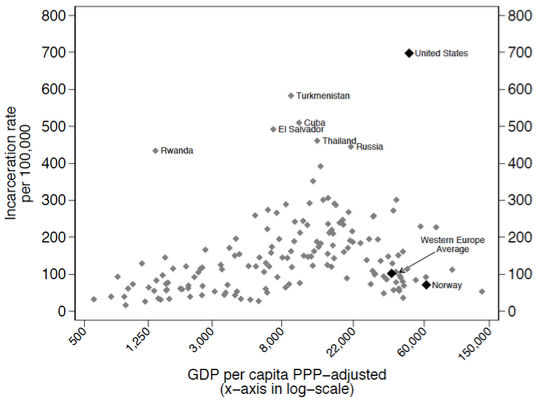 GDP per capita is adjusted for purchasing power parity (PPP) and reported in 2010 US dollars. The Western European countries used to construct the population-weighted average include Austria, Belgium, Denmark, Finland, France, Germany, Greece, Iceland, Ireland, Italy, Luxembourg, the Netherlands, Norway, Portugal, Spain, Sweden, Switzerland and the UK. Sources: Institute for Criminal Policy Research, International Monetary Fund and the World Bank. The Norwegian system places low-level offenders in open prisons, which have minimal security, as well as more freedoms and responsibilities than a US prison. More serious offenders who are at risk of violent or disruptive behaviour are sent to closed prisons with heightened security, creating a separation between minor and more hardened criminals. Norway has a policy of one prisoner per cell. This stands in contrast to the US, where inmates are often double or triple bunked and with a higher inmate-to-staff ratio, making it harder to ensure the personal safety of prisoners. All prisons in Norway offer education, drug treatment, mental health and training programs. In contrast, adequate funding for such initiatives is lacking in the US. After release, in Norway, there is an emphasis on helping offenders reintegrate into society, with access to active labour market programmes set up to help ex-convicts find a job and access to a variety of social support services such as housing, social assistance and disability insurance. In the US the safety net is less expansive, but even so ex-convicts often have a difficult time accessing services. Our research on Norway's criminal justice system serves as a proof-of-concept demonstrating that time spent in prison with a focus on rehabilitation can help ex-convicts reintegrate into society. The Norwegian prison system is successful in increasing participation in job training programmes, encouraging employment, and discouraging crime, largely due to changes in the behaviour of individuals who were not working prior to incarceration. A natural question is whether the positive effects from imprisonment found in Norway pass a cost-benefit test. The Norwegian prison system spends almost double the amount per inmate per year compared to other Western European countries and between two and four times more compared to US states. But rough calculations suggest these high rehabilitation expenditures are more than offset by the corresponding benefits to society. On the benefit side, there are three broad categories. First, there is a reduction in criminal justice system expenditures (including police department and criminal court costs) due to fewer crimes being committed. Second, there is increased employment, which results in higher taxes paid and lower transfer payments. We estimate that either of these first two benefit categories justifies the direct costs of prisons. The third benefit category is the reduction in victimisation costs due to fewer crimes being committed in the future. Victimisation costs are notoriously difficult to estimate, so we instead simply note that this category would make the comparison of benefits versus costs even more favourable. Finally, it is important to note that prison reform, particularly for the US, is more affordable than it may initially appear. This is because if prison sentences were shortened to the lengths in Norway, it would alleviate overcrowding and free up funds to pay for improved prison conditions as well as job training, education, drug treatment and post-release programmes. Authors’ note: This column is based on prior research by the authors (Bhuller et al. forthcoming), which received generous financial support from the Norwegian Research Council. Aizer, A and J J Doyle (2015), “Juvenile Incarceration, Human Capital and Future Crime: Evidence from Randomly-Assigned Judges”, Quarterly Journal of Economics 130(2): 759–803. Bhuller, M, G B Dahl, K V Løken and M Mogstad (forthcoming), “Incarceration, Recidivism, and Employment”, Journal of Political Economy. Cullen, F T (2005), “The Twelve People Who Saved Rehabilitation: How the Science of Criminology Made a Difference”, Criminology 43(1): 1–42. Harding, D J, J D Morenoff, A P Nguyen and S D Bushway (2017), “Short- and Long-term Effects of Imprisonment on Future Felony Convictions and Prison Admissions”, Proceedings of the National Academy of Sciences 114(42): 11103–11108. Martinson, R (1974), “What Works? Questions and Answers About Prison Reform”, The Public Interest 35: 22–54. Mueller-Smith, M (2015). “The Criminal and Labor Market Impacts of Incarceration”, University of Michigan Working Paper. Nagin, D S, F T Cullen, and C L Jonson (2009), “Imprisonment and Reoffending”, Crime and Justice 38(1): 115–200. Rose, E. K. and Y. Shem-tov (2018), “Does Incarceration Increase Crime?”, unpublished working paper.